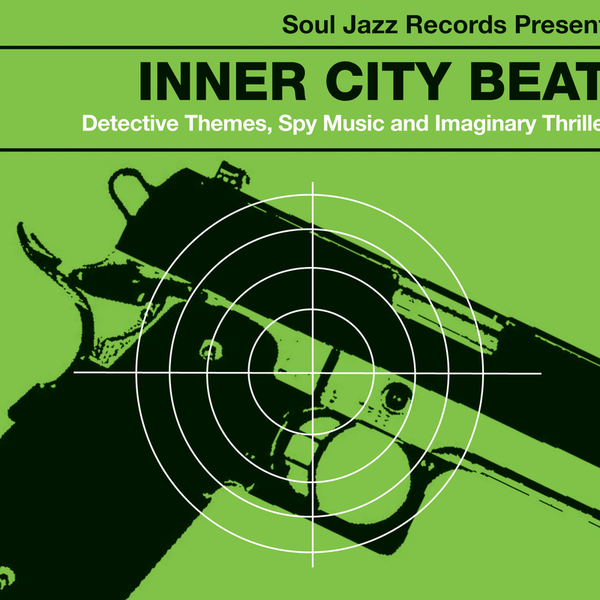 Soul Jazz Records new release Inner City Beat! Detective Themes, Spy Music and Imaginary Thrillers is a unique CD (and 2LP) release that comes with an exclusive limited-edition specially created 60-page graphic novel (by the mysterious cult 1960s pulp-fiction writer Mark ‘Badly’ Antringham). The music on the album is a killer selection of funky, deep, rare, exciting and dancefloor heavyweight ‘spy themes’, ‘detective music’ and thrillers from the 1960s and 1970s. The music spans heavyweight break-beat funk, deep and heavy jazz, super-catchy mod themes, imaginary super-charged orchestral soundtracks and more. These tracks are put together from British library music companies (DeWolfe, KPM, Conroy, Amphonic) all of whom supplied music regularly to television and films around the world during this period, often for use in detective and spy programmes, series and films. Created as work for hire in anticipation of television or film usage, many were never broadcast and have thus remained unheard, stored in the vaults for many years. Other tracks featured were used as incidental or title music in long-forgotten 1960s detective and cult programs. And whilst the names of the artists and composers featured on this album have remained relatively obscure (Syd Dale, Reg Tilsley, Johnny Pearson, Barry Stoller etc), the music they created is in fact some of the most well known and highly accessible music in the world - due to its widespread usage on these detective and thriller (and many other genre) television shows and films during this period. In the 1960s and 1970s, these British music libraries used to promote these recordings to television and film productions on limited-run vinyl pressings (usually housed in generic sleeves). Mostly pressed in runs of less than 1000 copies, the best and rarest of these original records are today highly sought after items and included here is a fine selection of some of these rare, collectible and very groovy tracks. "And whilst the names of the artists and composers featured on this album have remained relatively obscure (Syd Dale, Reg Tilsley, Johnny Pearson, Barry Stoller etc), the music they created is in fact some of the most well known and highly accessible music in the world - due to its widespread usage on these detective and thriller (and many other genre) television shows and films during this period. In the 1960s and 1970s, these British music libraries used to promote these recordings to television and film productions on limited-run vinyl pressings (usually housed in generic sleeves). Mostly pressed in runs of less than 1000 copies, the best and rarest of these original records are today highly sought after items and included here is a fine selection of some of these rare, collectible and very groovy tracks."